treatment and management of pediatric endocrine disorders. 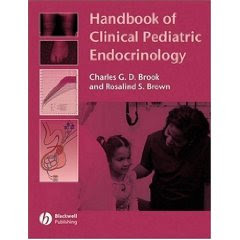 It is a companion title to Brook’s Clinical Pediatric Endocrinology, which is well established as the leading international work of reference in the field of pediatric endocrinology, covering endocrine disorders, their diagnosis and treatment.A practical text written by known experts covering in 12 chapters the most frequent endocrine disorders in childhood. management of pediatric endocrine disorders. disorders, their diagnosis and treatment.